The fairly long sharply pointed bill, dark cap, short legs, and long wings identify this bird as a tern of some kind. Caspian, Royal, and Gull-billed Terns all have heavier bills. The previous species also have black legs, unlike the orange legs of our quiz bird. Sandwich Tern has a yellow-tipped black bill and a prominent crest. The pale gray upperparts and clean white underparts are wrong for a Black Tern. A Least Tern would have a smaller bill and a white forehead. 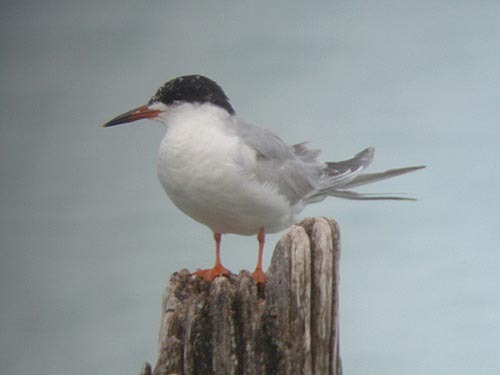 That leaves the trio of medium-sized Sterna terns that have been recorded in Illinois: Arctic, Common, and Forster's. Arctic Tern would have a shorter bill and shorter legs than our quiz bird and can be eliminated right away. Also, an Arctic Tern with a dark cap like our quiz bird would probably have gray underparts. The darkish primaries of our candidate suggest a Common Tern, right? After all, one of the best ways to tell adult Common and Forster's Terns apart in breeding plumage is by looking at the color of the folded primaries: pale, silvery gray in Forster's, darker gray in Common. The problem though is that this bird isn't an adult in breeding plumage, and we know this because the dark cap isn't solidly black but flecked with white. An adult Sterna tern in late May of any of the three above mentioned species would have a solid black cap. Remember, the date this bird was photographed was given as May 21. There are structural differences between the two species, including bill size and leg length. The bill of Forster's Tern is heavier than the bill of Common Tern, but without a direct comparison this difference is difficult to judge. The legs of our quiz bird look a little too long for a Common Tern, but again on a lone bird this difference can be hard to judge. The legs of our candidate look more orange than red, favoring Forster's. A similarly aged Common Tern would show some gray on the underparts; the underparts of our bird look white. Finally, the white area between the upper mandible and lower edge of the dark cap is wide and extensive on our quiz bird, definitely favoring Forster's Tern. This not-quite-adult Forster's Tern was photographed at Waukegan Beach in Lake County, Illinois on May 21, 2005.